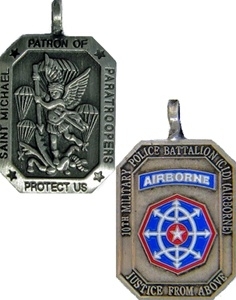 Back of Medal: Saint Michael Patron of Paratroopers, "Protect Us"
Soldiers traditionally wear this medal on their Identification Tags ("Dog Tags"), Key Ring, Rosary, or sometimes worn on a chain around their neck. These are the same ones that have been handed out for years by military chaplains. Medal comes with stainless steel ball chain.